Routers contain a chip similar to the BIOS on a computer. This chip contains the firmware for the router. Firmware is a combination of software and hardware control and it can be updated to improve the function or features of a router or to address problems with security or other things. This article will provide general information on upgrading router firmware. Verify your router information. You will want to make note of the Model Number, Serial Number, and the Hardware and Firmware version. This information is usually found on the identification sticker found on the bottom of the router or in the router software. Access your router manufacturer's website and go to the downloads area. Using the information collected in step 1, find out if there are any firmware updates available for your router. Some manufacturers will have you download the software to your computer. In some cases there is a utility built into the router itself that can check for updates automatically. Check your router documentation to be sure. If your router is not one that automatically updates, download the appropriate firmware update from the manufacturer and save it to your computer. Make sure your computer is connected to the router via cable or wirelessly. In the address bar located at the top of the screen, erase whatever address is in the bar and replace it with "192.168.1.1" without the quotes. Note that some routers use the address "192.168.0.1" so if it does not work right away, try the second option. 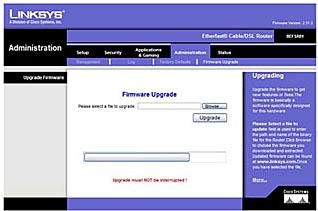 Look in the router configuration for a firmware update or upgrade option. This one from Linksys is found on the Administration page. Once the firmware has updated, the router will typically reboot. In most cases no other configuration is necessary. That's it! Your router firmware should be up-to-date. Be sure to visit the manufacturer's website periodically to check for updates that could extend the features or capability of your router.